Managing Director of the Bulk Oil Storage and Transportation (BOST) Company Limited, Kingsley Kwame Awuah-Darko says the 2015 half-year profit of his outfit is in excess of $21 million. According to the MD, the 2015 half-year profit was achieved through the hard work of staff, board and management of the company. 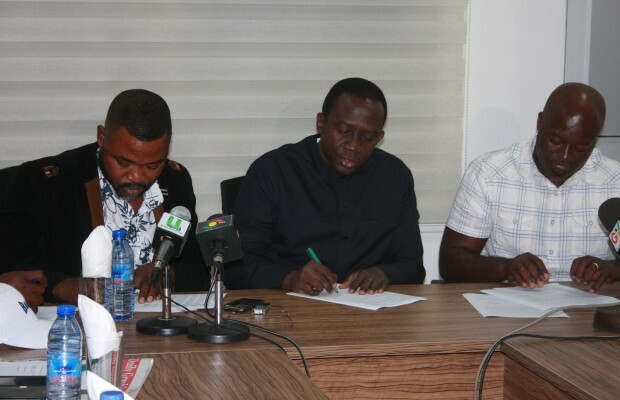 Speaking at the signing of MoU on conditions of service between unionized members of BOST and management in Accra yesterday, Mr Awuah-Darko said as part of measures introduced in 2014, his outfit would disburse 10 percent of the profit generated to the staff and management. “BOST today has moved away from the culture of entitlement to a performance based institution and this has been evident by the various levels of performance bonuses that have not been generated by an individual but by the team collectively. We went from 2013 from having a project loss of about $50 million to 2014 when we started this programme of having product gain of $3.5 million. “This year, we’ve gone from basically breaking even or making losses historically as a company in general to generating profit in excess of $21 million,” he said. Mr Awuah-Darko stated that he was confident that union members, staff and management would be highly motivated to effectively deliver and get performance bonuses for themselves. He added that he was pleased that management and the board together with the union members had been able to finalize the process which started about 15 years ago. Bernard Owusu, Local Unionized Chairman at BOST, commended the board and management of the company for engaging the unionized members in the re-structuring process which was 90 percent complete. “Over the past nine months, we, members of the Unionized Staff, have performed well which has brought in bonuses totaling about GH¢700, 000,” Mr Owusu said. He said they would fully support the Kakra Essamanh-led board in an ongoing corruption investigation at BOST that had led to the interdiction of some general managers and senior staff. “We are of the view that whoever is found culpable must not be spared but made to face the full rigors of the law,” he said.